YES! A new skirt from Deer and Doe patterns that I did thread-painting on! I added quite a few inches to the bottom width of the front 3 panels and less to the back panels in order to create a more flared skirt. I finished with a scalloped hem. The high waist makes it so graceful with a smooth transition from waist to hips! Often I feel the waistbands cut into the waist and cause bulging in the stomach which I hate! This is the PERFECT skirt for a high waist and no waistband!!!!!!!!!!! YAY!!!!!!!!!!!!!!!!!!! 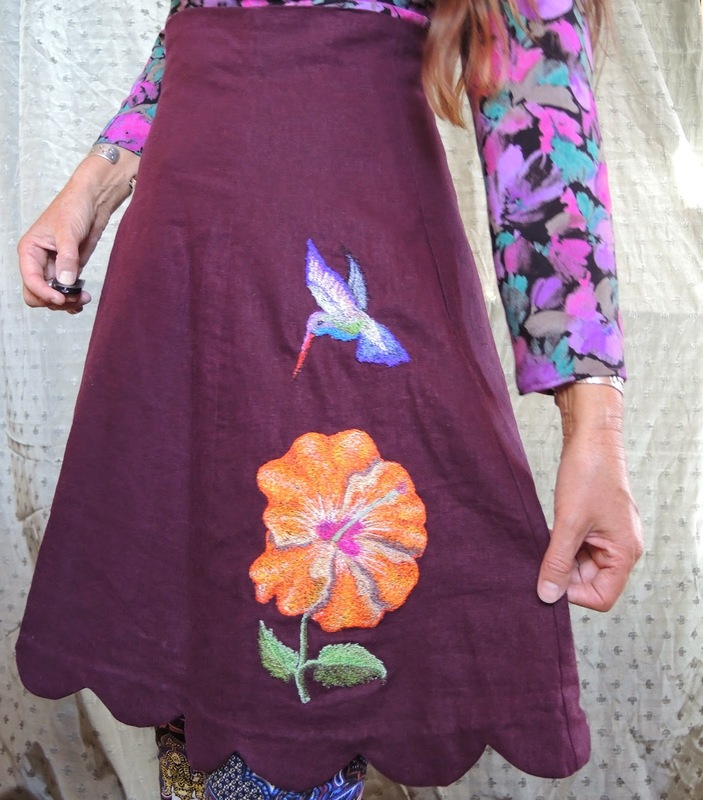 I did some free hand thread-painting of a hummingbird and hibiscus flower. I am very pleased with the way that worked out! I love the Hawthorn pattern but I do not understand why it came out baggy in the midriff area which is not at all what happened the first two times I have made this pattern. Could it really be that making it in a rayon caused such a big difference? 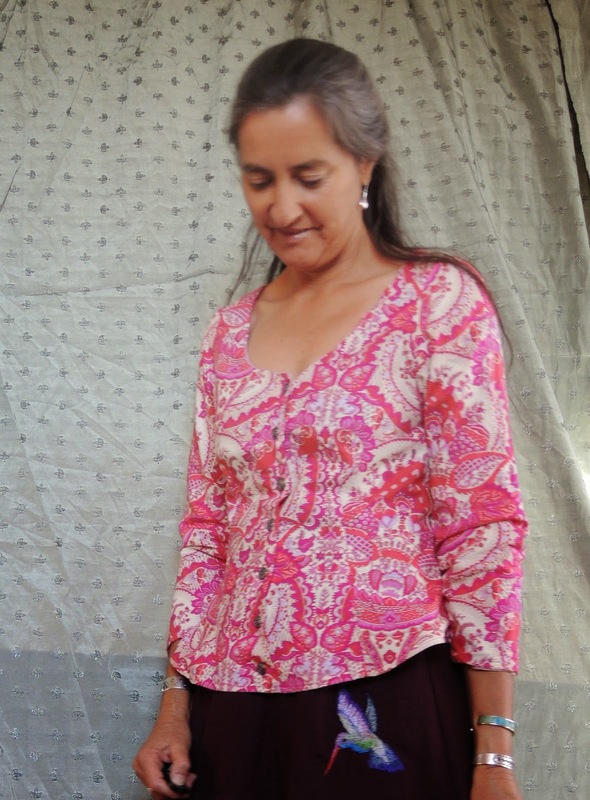 I made a long sleeve version of the New Look #6935 blouse. I think this designer organic quilting cotton is beautiful but as all quilting cottons go it was too scratchy for me. I lined it with a beautiful soft silk cotton blend and I love the feel. But I also had difficulties with this blouse. It seems that in adding sleeves they are not sitting right at the shoulder so they pull the neck apart more causing bra strap peekage which drives me nuts! 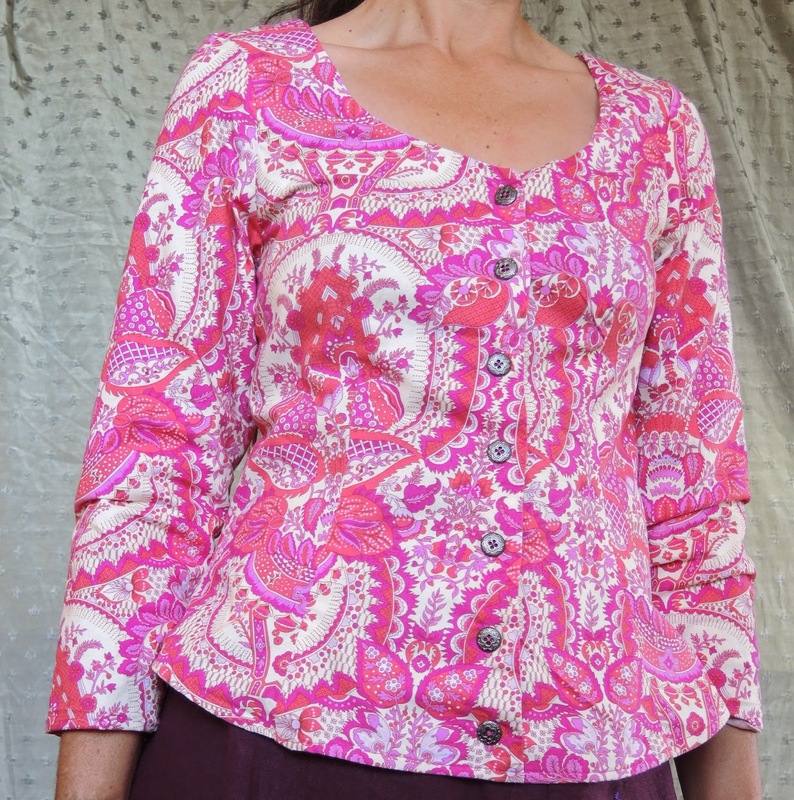 I am amazed I am continually inspired to sew even with these setbacks! So many pretty things.! 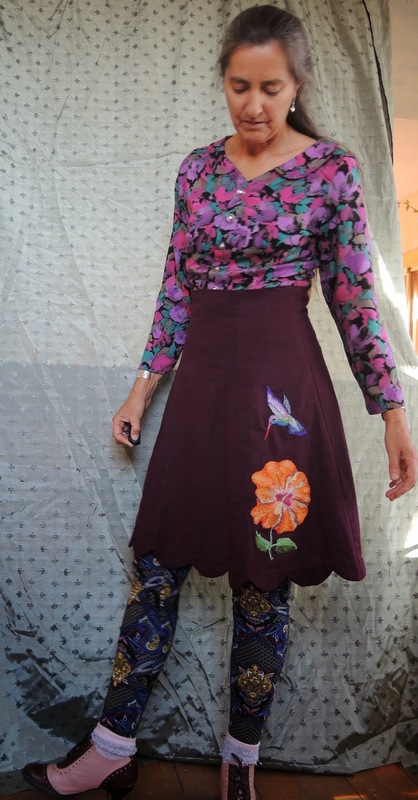 The thread painting is amazing and this skirt is super flattering;) the Hawthorne does not look bad but if it pulls and sits weird it's not comfy the opposite of what you were after! And yea crazy that we keep sewing even though its such a challenge or so many challenges :) but keep sewing cause as with everything your artistic eye is sew inspiring!